I love the story that John Piper tells in his book Don’t Waste Your Life of a soldier fighting on D-Day which is appropriate to share on Veteran’s Day. “He’d fast-talked his way into the Marines at fourteen, fooling the recruits with his muscled physique. . . . Assigned to drive a truck in Hawaii, he had grown frustrated; he wanted to fight. He stowed away on a transport out of Honolulu, surviving on food passed along to him by sympathetic leathernecks on board. He landed on D-Day [at Iwo Jima] without a rifle. He grabbed one lying on the beach and fought his way inland. Now, on D+1, Jack and three comrades were crawling through a trench when eight Japanese sprang in front of them. Jack shot one of them through the head. Then his rifle jammed. As he struggled with it a grenade landed at his feet. He yelled a warning to the others and rammed the grenade into the soft ash. Immediately, another rolled in. 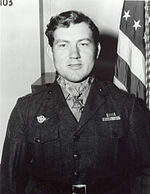 Jack Lucas, seventeen, fell on both grenades. ‘Luke, you’re gonna die,’ he remembered thinking. . . . The numbers vary, but many of the soldiers involved in D-Day were teenagers. This is true of other wars as well. So many times we encourage our youth to look to adults as role models, but often we need to be looking at them as they lead the way with their passion. Thanks, today and everyday, to all who have served our country in the military.